Chief of Staff to Governor Abiola Ajimobi of Oyo State, Gbade Ojo, has received a Pan-African Distinguished Leadership Honour’s award for contributing to the development of democracy. 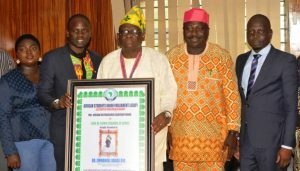 Ojo was honoured by the African Students’ Union Parliament (ASUP) on Wednesday in Ibadan. ASUP is the umbrella body of students from the 54 member countries of African Union. The Speaker of ASUP, Mr Kewul Abel, said that Ojo was honoured because of his supportive role to Ajimobi, coupled with his philanthropic gestures to widows and the vulnerable. Abel, who was represented by Solomon Mensah, the Deputy Speaker, said the decision was taken during the union’s conference at the University of Ghana, Legon in Accra. Mensha said ASUP had taken its time to scrutinise Ojo who had committed his time to serve the common good in accordance to the Pan-Africanism Ideology. He said that Prof. Chukwuma Ozumba, Vice-Chancellor, University of Nigeria, Nsukka, and President Umar Al-Bashir of Sudan were among past recipients of the award. Other former recipients are Justice Ibrahim Auta of the Federal High Court of Nigeria and Dr Ogbonnaya Onu, the Minister of Science and Technology. Reacting, Ojo charged youths to emulate the virtues of excellence displayed by past African nationalists which made them a beacon of light to the entire African continent. The associate professor of comparative politics recalled the contributions of some African Nationalists like Obafemi Awolowo, Nkwame Nkrumah, Nnamdi Azikiwe and other great African nationalists. Ojo said the nationalists distinguished themselves during their youthful days with their tremendous contributions to a better Africa. According to the Chief of Staff, the menace of examination malpractice and drug addiction stemmed from an inferiority complex.